The objective of Innovation Research is to identify new product and service concepts that add real value to consumers. 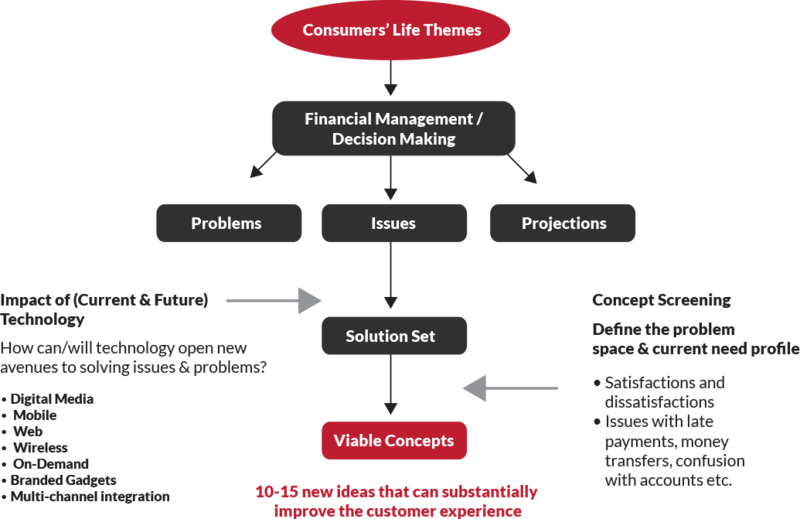 We follow a problem based ideation process to generate useful and viable ideas that are practical and implementable. The research follows a three phase process: Identify Problem Set; Develop Opportunity Set; Generate Concept Set. The problem set starts with the concrete and easily identified problems and progresses to the more difficult psychological and social-psychological problems and issues. The problem set included practical issues with balancing the check book online to more abstract issues such as poor financial planning skills, psychological barriers to realistic goal setting, and controlling impulsive spending behaviors. The problem set is used to develop opportunity set. An Opportunity Set outlines broad market and product opportunities emerging from the consumers problems. Identified an opportunity to partner in the consumers’ long term financial life by offering a host of internet based software solutions that address planning and goal setting issues. New ideas and concepts are generated for each opportunity area with preliminary screening based on criteria developed in consultation with the client. An Innovation Portfolio of the best ideas is presented to the client as the final deliverable. Innovation Portfolio of 82 ideas crystallized around 8 opportunity areas was presented to the client.